All Star Sports Birthday Cake! For this sports birthday cake, I started with 2 side by side 9x13 cakes made from scratch. I covered a small layer of grass green icing over the two cakes first. 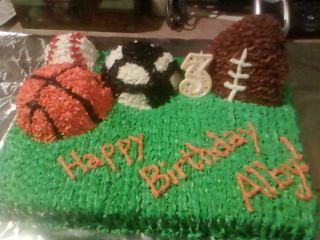 I used two single jumbo cupcake (mini round) aluminum disposable tray pans (upside down) for the basketball & soccer ball. I used a regular sized cupcake right-side up for the baseball & a loaf pan cake that I cut into the shape of the football & cut in half to give the appearance of being stuck in the grass. I started icing with the bases of each ball- white for the soccer ball & baseball, orange for the basketball & brown for the football. Then I added the red accents on the baseball, black on the soccer ball & basketball, then white on the football. The last step was icing the green grass, then adding a number candle & words with leftover orange icing. And whalah...the perfect "All Star Sports" Birthday Cake!